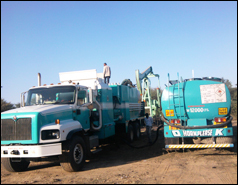 Oil well tubing and surface pipelines for the prevention and treatment of wax deposition in oil wells. Paraffin depositions cause a loss of billions of dollars per year worldwide due to enormous cost of prevention and remediation, reduced or deferred production, well shut-in, pipeline replacements and/or abandonment, equipment failures, extra power requirement and increased man power needs. Conventional technique to control paraffin deposition in the oil tubing was mechanical scrapping of tubing. 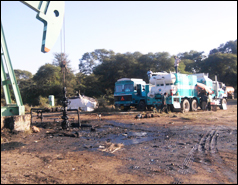 Invariably scrapper used to trap in wax inside the tubing and then difficult to remove the scrapper from oil well tubing which cause damage of well and then work over job is required which is a highly expensive and plagued with other associated problems. Steam, chemicals and solvents are used to dissolve the paraffin deposition are also expensive, hazardous environmentally as well as fire hazard. Even, sometimes pipelines get burst due to pressure build up during the above process. Prevention of paraffin deposition in oil well tubing by using microbes offers a cost effective approach. To solve this problem, a paraffin degrading bacterial strain(s) would have to be developed for degradation of paraffin deposition inside the oil well tubing surface and transportation oil pipeline. After 5 years of research specific Paraffin degrading bacterial strain was developed jointly by TERI, New Delhi and Institute of Reservoir Studies (IRS), ONGC, Ahmedabad. Paraffin degrading bacterial strain designated as PDS-10 was tested under laboratory condition at TERI, New Delhi and IRS, ONGC, Ahmedabad and got a Joint patent between ONGC and TERI. Initially the technology was used in 10 oil wells of ONGC at Western Oil field of India and paraffin deposition was eliminated in these oil wells for more than 2 ½ years. After application of these microbes paraffin deposition in well tubing was prevented and there was not a single scrapping in two years. Oil productions from these wells were also increased. This technology has been tested in 38 oil wells of ONGC, Ahmedabad Asset jointly by IRS, ONGC, Ahmedabad Asset and TERI, New Delhi. ONGC gained approx. 2291 m3~2062 MT of additional crude oil by injecting selected microbes into selected oil wells of ONGC, Ahmedabad in Gujarat. So far, OTBL has implemented PDB Technology in total of 270 oil wells, comprising of 135 oil wells of ONGC Mehsana Asset, 32 oil wells of ONGC Ahmedabad, 20 oil wells of ONGC Ankleshwar Asset, 34 oil wells of ONGC Assam Assets & 4 oil wells of Oil India Ltd, Duliajan.